The quickest Saint in history. That's what St. Anthony was known for, the quickest canonization - in less than a year, by Pope Gregory IX, back in 1232. 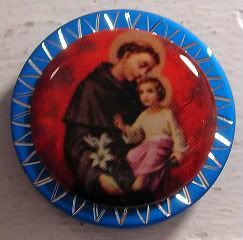 I magnetblogged about him when we were in Italy late last year, just after we visited the Basilica of St. Anthony. The saint is entombed here, and many people make their pilgrimages to touch the end of his coffin. In fact, that left side of the coffin is actually shiny from the gentle touch of millions of prayers over the last eight centuries. It's truly a sight to behold, the power of faith and prayer in action. Oh, I'm not talking, Praise the Lord, slap the forehead, you're healed! kind of prayer. Rather, it's the silent and heavy prayer of the hopeful and desperate, single-filed patiently waiting for their turn at the coffin. I can actually count on one hand the times I've ever felt the presence of God in a church, and this was one of those times. It could have been the church. It was beautiful - full of several different architectural styles of day, or rather years, since it took about 70 years to complete (1238 - 1310) and has a terrific history. The opulence and reverence is truly something - you know us Catholics and our churches, we know how to send that glory unto God, for sure. Or, it could have been the people. Big and old churches are funny - the more significant it is, the more activity going on inside. This side chapel, that nave, that family crypt, that reliquary, this piece of art. Not to mention, candles being lit, silent prayer in every corner, and Mass being served as tourists walk around with their cameras in hand. While distracting, it's comforting that everyone's there for one reason, faith. You can't get that in every place of worship you visit. But, once in a while, if you can manage to find the stillness for a few minutes, you really can feel the presence of a higher being. I've got my hooligan dad on the brain, hence today's magnet. But, also St. Anthony's the patron saint of lost things. Hopefully I can find whatever it is I'm lookin' for.